Unless there come a revolt first, (Vatican Council II) and the Man of Sin be revealed, the son of Perdition. 2 Thess: 2:3 Apoc; 18:4-5 The first AntiChrist, on his way to Saint Hood. woe woe woe. 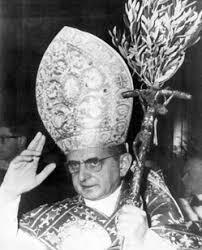 On Tuesday the Congregation for the Causes of Saints approved the second miracle needed for the canonization of Blessed Pope Paul VI, allowing his canonization to take place, possibly later this year.